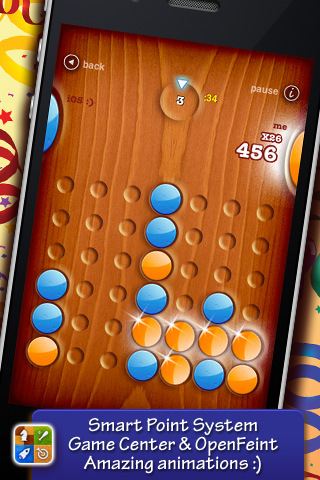 The first iPhone games round-up of this year consist of intelligent thinking puzzle and strategy games. If you’re one that loves to think and have your brain and wits challenged, you might just find what you need within this round-up. I have here with me 3 games: Rail Road Constructor, a puzzle like game where you are to lay down rail track and navigate a train to its finish line before the time runs out. 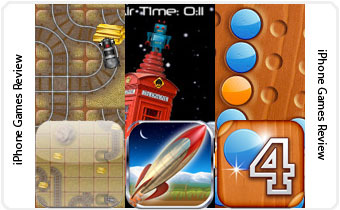 Rocket Math, a perfect educational game to allow younger children to hone and practice their mathematics while having fun. 4 in a Row, classical connect 4 strategy game with a twist in scoring system. Read on for the reviews of the games mentioned! There is a start and there is an ending point. In between the start and end are several gold pieces that you can pick up with your train as long as you pass through them. You are given 2 pieces of rail tracks to choose from at any given time. Every time you put one down a random one generates. Tracks are designed to turn directions and so on. 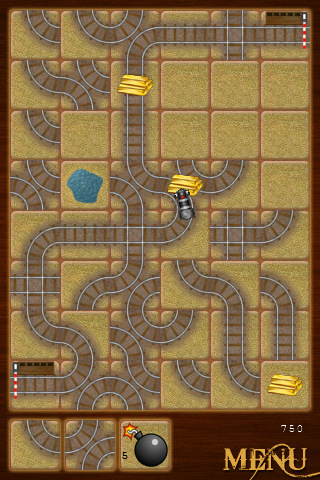 You have to rely on several types of tracks in order to navigate the level to the highest effect (getting all gold bars while reaching the end point). There are also some boulders and obstacles in the way that increase the difficulty. Due to the random generation of the pieces as well as a limited 2 slot to choose from, there may be some difficulties. 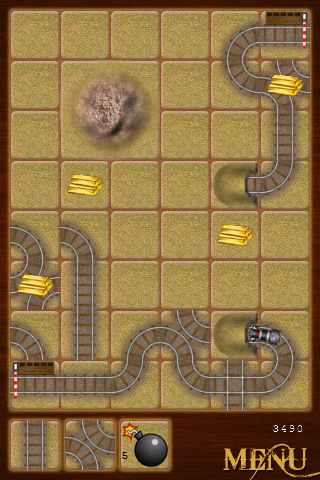 Levels themselves are randomly generated; placement of gold bars and the obstacles are changed in each new level. This meant that no one level should be the same, making you think and plan every single time a new level begins. The good thing is, the challenge will always be there. The bad thing is, the random generation can sometimes produce levels that are almost impossible to complete fully (not all gold bars are attainable). Add that up together with the 2 pieces of track selection, be prepared for some frustrating times should you be unlucky with the generation. They is however still the presence of planning and strategic thinking. Placing the tracks down at random will result in complete failure. You will often find yourself discarding tracks (by laying them down anywhere on the level) hoping for the right one to come by. And sometimes it comes rather late, resulting in the level filled up with useless pieces. Don’t worry though as there is the ability to destroy a piece of track with the bomb. You are limited to 5 bombs per level, so use them wisely. Graphics wise the game is rather bare and unattractive. Sound effects is alright but for prolong playing I would prefer and encourage you to listen to your own music. Indeed the game is an alright puzzle game for people who want to think and work their brains while still having fun. The random generation can be frustrating at times but overall it does the job well enough. The major problem though is the lack of incentives or motivation to play on. Yes I could go on and on with the random levels but so what? The lack of anything special to work for makes game bore rather quickly. I guess it requires a little more innovation to hit that hall of fame mark. In conclusion, for the price tag of $0.99, the game is average at best. (you might want to look at other alternatives first before deciding). Educational games have come a long way. Who doesn’t want to have fun while learning? 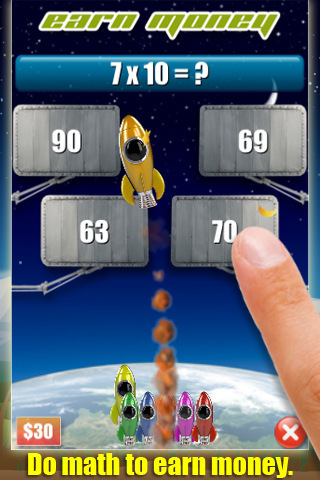 Rocket Math is an educational game that is designed for both the iPad and iPhone (has HD graphics for the iPad). What it teaches you is like its title states, math! From addition to square roots, it covers almost all fundamental topics of basic mathematics. What it does is allow players to create their very own rocket. Upon creation, they can choose from the different topics of math that they want to try out. They will then launch their rocket into the sky and depending on how your rocket is designed, the amount of air time, the time you have to answer questions, varies. Once in space, you will be greeted with questions and floating number bearing objects that you can tap to answer the questions. As you progress through the game, you will be able to have more air time and thus answer more questions, giving you a higher score as well as allowing you to practice your fundamentals for a longer time period. The way the game is designed is clever, and to think that having a more powerful rocket would be awesome, it just makes you practice even more questions! There is also the mode the earn money. This mode makes players answer questions (pertaining to math of course) and each correct answer will award them with money to spend decorating or upgrading their rockets. Everything is math related, and in a fun way as well. The motivation of an awesome looking rocket and longer air time resulting in longer periods of practicing questions is definitely a win-win situation for the children. The graphics are also brightly coloured and sound effects of fun and joy. The game just feels great for its target market of the younger children. It is a sleek blend of education and fun, definitely something you can get to let your children “play” on the go. For the price tag of $0.99, I don’t see any reasons not to get it for your kids. If you’re older than say 12 years old or so (not sure what grade that is in your country), I don’t think this game will do much purpose (too easy, hardly helpful). 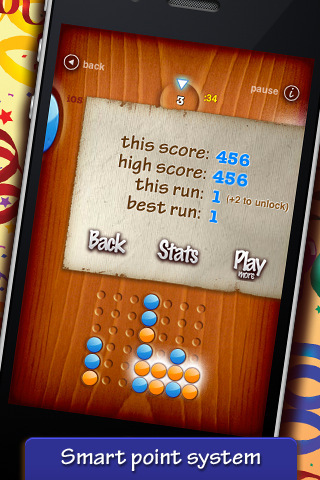 Below that, time to brush up your math while having lots of fun! Who says math can’t be fun! 4 in a Row is basically Connect Four. Not sure what Connect Four is? It plays like this: 2 players will take turns dropping their own coloured disc from the top of a 6 row 7 column vertically suspended grid. The objective? To connect 4 in a row whether is it diagonally, vertically or horizontally. Sounds simple? Indeed it is. Requires strategic thinking and planning? Definitely. Similarly, 4 in a row ports that right into your iDevice! The thing unique about this game (and almost all over the games from this developer Finger Arts) is the scoring system. You basically get points while dropping your coloured disc. It seem as though the more turns you take the higher your score becomes. However, as time passes there is this score multiplier that will drop, meaning if you take longer to think and make a move, your score would be lesser compared to someone who can think fast. 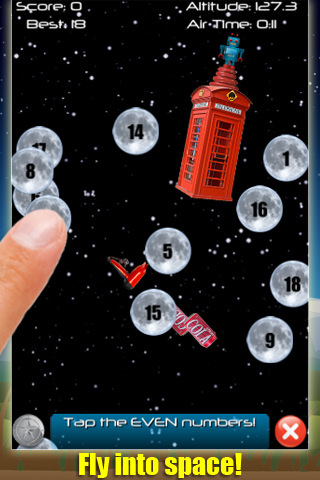 The game has 4 difficulties, with only the easiest unlocked on purchase. You will have to then win the AI continuously for a specific number of times before you can unlock the next difficulty level. The higher the difficulty, the smarter the AI. That means you have to think more and plan more. While I do sing praises for their innovative scoring system for their previous games such as the Hangman RSS, Sudoku 2 and Guess the News, I do not feel that it is in the right place when we consider this game. I mean, yes it is there and all but it just doesn’t feel right. I mean with it there or not it doesn’t really seem to make much of a difference other than the highscore boards. I’m thinking that for such games a point system just don’t fit in. It is like a point system for games like checkers, or snake and ladders, nothing wrong but nothing right either.